Be ready to throw together a spread. Whether you choose to serve appetizers, stock multiple candy jars, hoard nuts and pretzels, or heat queso dip with chips on the fly – stock the pantry and fridge with something you can pull together for company in a flash. It’s so much less stressful than trying to tidy house while the hubs runs out to the store. Years ago, we had the sweetest Longaberger Basket representative, Ann. She had open houses for new products, and always served a version of these tasty appetizers and strawberry iced tea. Mix ingredients in a bowl and spoon onto baguette. Bake on a greased sheet pan at 400 degrees for 8-10 minutes. These bites may be assembled and frozen for up to 2 months. Bake unthawed, just add about 5 minutes to the cooking time. My aunt has definitely made some of my favorite dishes over the years, but this one is always a showstopper. Mix together oil and vinegar to create a vinaigrette. Toss together cubed cheeses, top with red pepper and onions, and pour vinaigrette over the top. Serve with sourdough bread or sliced baguette. simple but a splurge: Head to your local specialty food store and stock up on canned nuts, jarred olives & peppers, some nice cured meats & cheeses, tomatoes, and a good crusty bread for an easy to assemble antipasto platter (yummy, beautiful, & impressive). mini frittatas – so simple – brown some sausage, roast some veggies, or crisp some bacon then choose your cheese, spinach or none and place 2 T full per cup of a well greased muffin tin. Beat some eggs with a little milk or half & half, pour over your fillings and bake 15-20 minutes at 375 degrees. They freeze easily and actually microwave pretty well. 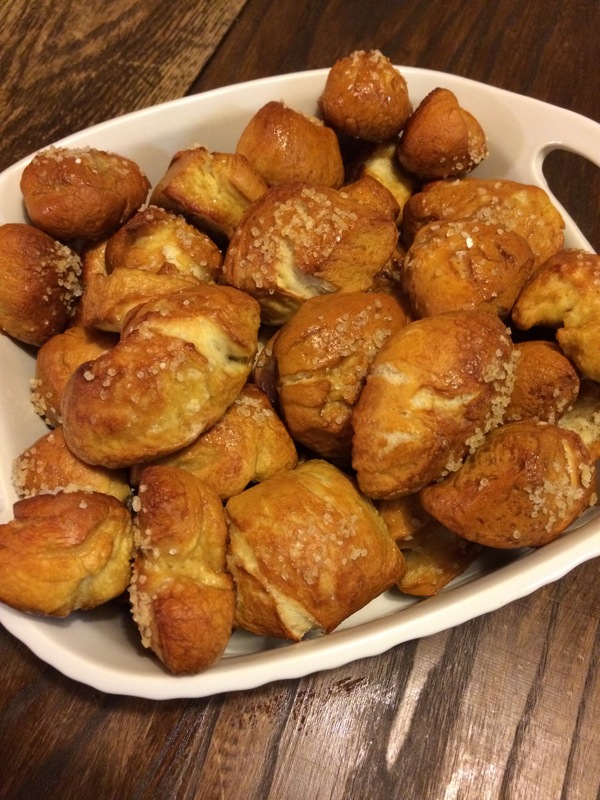 garlic knots – I like these but I like to add lemon zest to the compound butter. Even better, buy a nice jarred marinara to heat and serve on the side. You know you will be using it, so go ahead and stock the bar. It’s so not the picture of southern hospitality when all you have to offer guests is water, ice water, or hot water with lemon. Well, there’s always that questionable carton of milk. save: get a couple nice bottles of red & white wine; select or create a signature cocktail and keep the ingredients on hand all season long. If the weather is cool, mulled wine is always a beautiful presentation and quite yummy. Keep it clean, or if you have kids, clean enough & not too smelly. Pick a couple of days a week and clean the bathrooms, floors, and kitchen. Melissa at the Inspired Room has some great routine ideas for keeping your house “clean enough”. Put on a crockpot meal and declare a laundry day. I heard that…Not. Nice. Here’s my reasoning…avoid a. running out of socks on the coldest day of the year b. having Mt. Laundry when unannounced guests show up and c. scrambling to hide Mt. Laundry when said guests ring the bell. If you have one laundry day, you wash, dry, fold, hang, and iron; you’re all set for the week. See? You know you have a Mt. Laundry too. Have a 5 minute plan… wipe down counters & faucets, vacuum the rug, clean mirrors, spray Febreeze or whatever you think will make the biggest bang for your buck in your house when Uncle Eddy arrives a day early. The best tip I’ve found, keep the sinks clean – sounds weird, but it works & the house looks neater. Spend an extra half and hour at the end of the day… a little cleaner in the toilets (be careful if you have tots or pets — it’s gross, but they both get in the water), wipe down bathroom & kitchen counters and don’t leave the dishes for tomorrow. Find pockets of time during the week (waiting 5 more minutes for something in oven, a child to put on shoes, coat and potty one more time) and instead of checking your Facebook one more time dust, clean a window, change the towels in the bathroom & kitchen, wipe out the microwave – chip away at all those other little cleaning tasks. These tips seem so do-able I think I may even be able to keep this routine up. Try these for a house full of holiday smells in a snap! « Creating Peace at Home – Hopefully!